Immune response to MenACWY-TT, diphtheria, and tetanus was not influenced by co-administration of vaccines. The co-administration of quadrivalent meningococcal conjugate vaccine with incorporated tetanus toxoid (MenACWY-TT) with diphtheria-tetanus-acellular pertussis vaccine (Tdap) is noninferior to isolated vaccination for adolescents and young adults and does not compromise immunity, according to a study published in Vaccine. An international team of researchers conducted a phase 3, randomized, controlled, partially blind analysis to assess the immunization and safety implications associated with the co-administration of MenACWY-TT with Tdap vs separate vaccine administration in adolescents and young adults. Healthy individuals (n=660) aged 11 to 25 years were randomly assigned to 1 of 3 vaccination groups: MenACWY-TT and Tdap at month 0, MenACWY-TT at month 0 with Tdap at month 1, and Tdap at month 0 with MenACWY-TT at month 1. Serum bactericidal and enzyme-linked immunosorbent assays were used to measure immune response and antibody concentrations, respectively; immunosorbency assays were targeted for anti-diphtheria, anti-tetanus, anti-pertussis toxin; anti-filamentous hemagglutinin; and anti-pertactin antibodies. Safety and noninferiority were also evaluated. Results suggest that immunogenicity of MenACWY-TT co-administered with Tdap is noninferior to isolated vaccine administration with anti-diphtheria and anti-tetanus antibody concentrations >1 IU/mL for each. Noninferiority criteria were achieved for anti-pertussis toxin but not for anti-filamentous hemagglutinin or anti-pertactin antibodies. 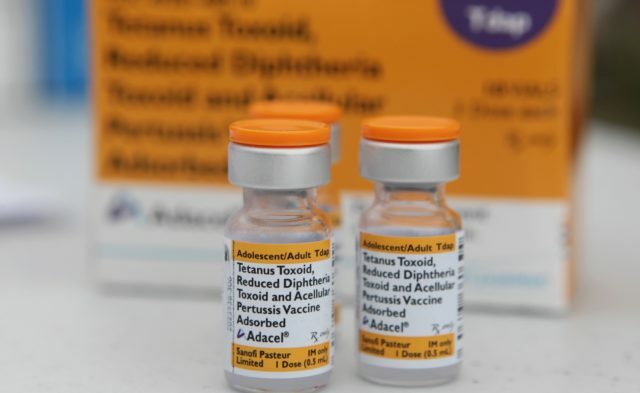 More than 93% of all participants demonstrated response to each of the 4 meningococcal serogroups; more than 99% demonstrated seroprotection against anti-diphtheria and anti-tetanus and more than 85% had booster responses to pertussis antigens. Disclosure: Funding and manuscript approval was provided by GlaxoSmithKline Biologicals SA.